In the above example the methods that are invoked is from class B but not from class A, and this is due to Method Resolution Order(MRO). Python follows a depth-first lookup order and hence ends up calling the method from class A. By following the method resolution order, the lookup order as follows. Python follows depth-first order to resolve the methods and attributes. So in the above example, it executes the method in class B. In the older version of Python(2.1) we are bound to use old-style classes but in Python(3.x & 2.2) we are bound to use only new classes. New style classes are the ones whose first parent inherits from Python root ‘object’ class. Method resolution order(MRO) in both the declaration style is different. Old style classes use DLR or depth-first left to right algorithm whereas new style classes use C3 Linearization algorithm for method resolution while doing multiple inheritances. In the above Example algorithm first looks into the instance class for the invoked method. If not present, then it looks into the first parent, if that too is not present then-parent of the parent is looked into. This continues till the end of the depth of class and finally, till the end of inherited classes. So, the resolution order in our last example will be D, B, A, C, A. But, A cannot be twice present thus, the order will be D, B, A, C. But this algorithm varying in different ways and showing different behaviours at different times .So Samuele Pedroni first discovered an inconsistency and introduce C3 Linearization algorithm. If a class inherits from multiple classes, they are kept in the order specified in the tuple of the base class. 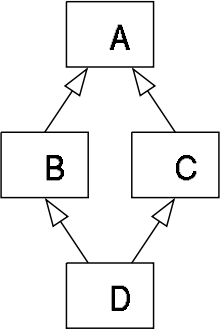 Inheritance graph determines the structure of method resolution order. User have to visit the super class only after the method of the local classes are visited. Is Bitcoin a digital currency?